I recently had the chance to catch up with some of my former FileNet colleagues, David Lewis and Brian Gour, who are now at Vega Solutions and walked me through their Unity 7 product release. Having founded and run a boutique ECM and BPM services firm in the past, I have a soft spot for the small companies who add value to commercial products by building integration layers and vertical solutions to do the things that those products don’t do (or don’t do very well). Vega Interchange, which takes one of their core competencies in content migration and creates an ETL platform for moving content and processes between any of a number of systems including Documentum, Alfresco, OpenText, four flavors of IBM, and shared folders on file systems. Content migration is typically pretty complex by the time you consider metadata and permissions mappings, but they also handle case data and process instances, which is rarely tackled in migration scenarios (most just recommend that you keep the old system alive long enough for all instance to complete, or do manual migration). Having helped a lot of companies think about moving their content and process management systems to another platform, I know that this is one of those things that sounds mundane but is actually difficult to do well. 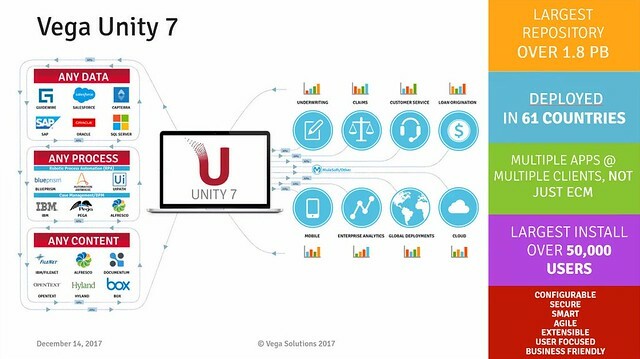 Vega Unity, billed as a digital transformation platform; we spent most of our time talking about Unity 7, their latest release, which I’ll cover in more detail below. Vertical solutions for insurance (underwriting, claims, financial operations), government (case management, compliance) and banking (onboarding, loan origination and servicing, wealth management, card dispute resolution). Unity 7 is an integration and application development tool that links third-party content and process systems, adding a consistent user experience layer and consolidated analytics. Vega doesn’t provide any of the back-end systems, although they partner with a couple of the vendors, but provide tools to take that heterogeneous desktop environment and turn it into a single user interface. This has a significant value in simplifying the user environment, since they only need to learn one system and some of the inter-system integration is automated behind the scenes, but it’s also of benefit for replacing one or more of the underlying technologies due to legacy modernization or technology consolidation due to corporate acquisition. This is what systems integrators have been doing for a long time, but Unity makes it into a product that also leverages the deep system knowledge that they have from their Interchange product. Vega can add Unity to simplify an existing environment, or come in on a net-new ECM/BPM implementation that uses one of their partner technologies plus their application development/integration layer. The primary use cases are federated enterprise content search (where content is indexed in Unity Intelligence engine, including semantic searches), case management applications, and creating legacy modernization by creating a new front end on legacy systems to allow these to be swapped out without changing the user environment. Unity is all about rapid development that includes case-based applications, content management, data and analytics. As we walked through the product and sample applications, there was definitely a strong whiff of FileNet P8 in here (a system that I used to be very familiar with) since the sample was built with IBM Case Manager under the covers, but some nice additions in terms of unified interface and analytics. Their claim is that the Unity Case Manager would look the same regardless of the underlying technology, which would definitely make it easier to swap out or federate content, case and process management systems behind the scenes. In the sample shown, since IBM Case Manager was primary, the case view was derived directly from IBM CM case data with the main document list from IBM FileNet P8, while the “Other Documents” tab showed related documents from Alfresco. Dynamic foldering can combine content from different systems into common folders to reduce this visual dichotomy. There are role-based views based on the user profile that provide access to data from multiple systems – including CRM and others in addition to ECM and BPM – and federate it into business objects than can include records, virtual folder structures and related objects such as people or claims. Individual user credentials can be passed to the underlying systems, or shared credentials can be used in connectors for retrieving unrestricted information. Search templates, system connectors and a variety of properties are set in a configuration console, making it straightforward to set up and modify standard operations; since this is an XML-based declarative environment, these configuration changes deploy immediately. The ability to make different types of configuration changes is role-based, meaning that some business users can be permitted to make changes to the shared user interface if desired. Unity Intelligence adds a layer of visual analytics that aggregates data from the underlying systems and other sources; however, this isn’t just visualization, but can be used to filter work and take action on cases directly via action popup menus or opening cases directly from the analytics interface. They’re using open source tools such as SOLR (search), Lucene (information retrieval) and D3 visualization with good effect: I saw a demo of a Sankey diagram representing the workflow through cases based on realtime data that provided a sort of process mining view of work in progress, and allowed selecting dates for past views of work including completed cases. For case management, in which processes are semi-structured (at best), this won’t necessarily show process anomalies, but can show service interruptions and opportunities for process improvement and standardization. They’ve published a video showing more about Unity 7 Intelligence, as well as one showing Unity Semantics for creating pivot tables for faceted search on content repositories. Next Next post: Prepping for OPEXWeek presentation on customer journey mapping – share your ideas!